Still one of the best in the business. Tucked away in a beautiful hidden location behind the hustle and bustle of drunken dwellers of The Gate – it is traditional and not too “Medieval Times”. Expect lots of potted and cured things on the menu. 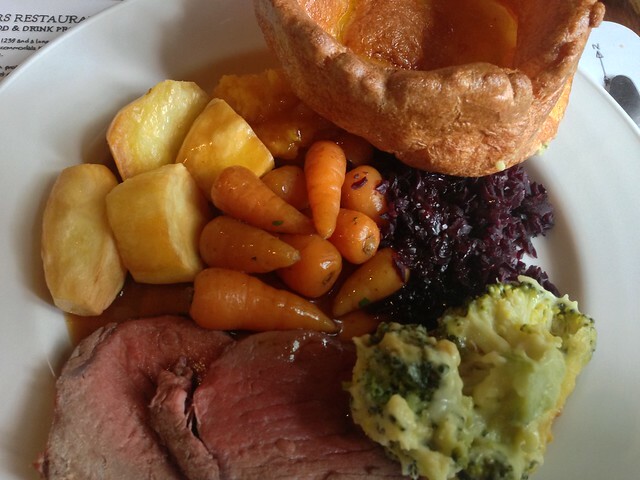 Their Sunday roast appears as part of the usual set menu, which is two courses for £15 or three for £18 – top end for lunch, good value for early dinner, and great on a Sunday, given how good it is. We love the generous portion of excellent potted smoked mackerel, served with a zingy gin pickle, and sour dough toast. As with most potted dishes, there’s never enough toast, but bread on the side is generously topped up as you eat. Bonus point. 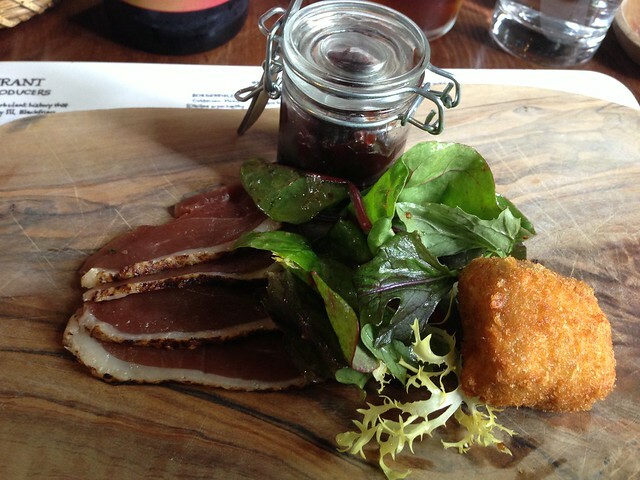 The duck ham, cherry & anise chutney with leg slices also impresses with incredible flavours in the chutney. We pander the idea that on a Sunday the starter should be skipped, but these are a great warm-up. Our eye is very much on the prize, though – and it looks awesome. Though many others are into their fish & chips (looked good), and sausages, pan haggerty etc., it’s all about the roast meat plate. We usually find that unless you’re too lazy to make it, it is never as good as home-made, but Blackfriars Sunday roast is the best we’ve had. We resist the temptation of pork and have succulent obviously slow cooked lamb, and the rib of beef – served just pink. It’s a hulking plate that nearly defeats us, but every component is excellent. The lightest Yorkshire pudding is the best in recent memory, almost like deep-fried pork crackling. Sweetly spiced picked cabbage is addictive, and even a cheesey broccoli is a welcome addition. Spot on roast potatoes, carrots, mash, and swede mean this is a proper belly buster – as it should be, but we power through with a few bottles of Sam Smiths (£4.40, but amazing). Desserts are indulgent. The Wylam steeped honey mascarpone donuts(!) 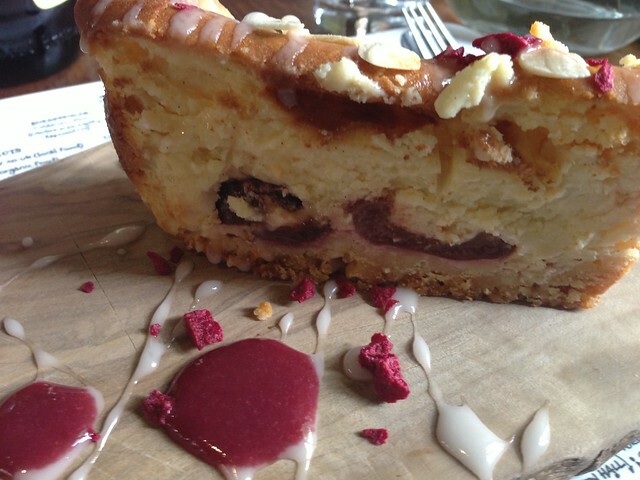 and STP are oh so tempting, but the curious concoction of cherry bakewell cheesecake proves too intriguing. Not too dense, not too sweet, it’s a hefty portion of something delicious. Service can’t be faulted, and there is definitely something to be said for the location adding to the atmosphere of the place. Blackfriars also won awards for its sourcing and sustainability – check out the placemats when you go. Drinks are pricey at £4.20 & upwards for a pint, but the selection is local, and has some great picks – like shunning the typical tea choices for local TeaShed. We’ve got a sneaking suspicion that The Feathers Inn does a damn good Sunday roast, and we have to tackle the ubiquitous Broad Chare version in a few weeks – purely for comparison you understand – but as it stands – the best Sunday lunch in toon.